Playa del Carmen may have been a small fishing village a couple of decades ago but now, it is a vibrant tourist destination with plenty to do. But first things first, here is a little bit of geography of Playa del Carmen. It will help you understand how the city was developed and where to find the activity that most suits your needs. Playa del Carmen’s main thoroughfare runs parallel to the shore and serves as a pedestrian walkway for travelers and locals. The avenue is lined with an assortment of restaurants, hotels, hostels, condominiums and bars. The shops in the area sell almost everything you can think of, ranging from trendy clothes to Mexican handicrafts and Cuban cigars. Intersecting with the avenue are streets that all lead to the beach. Along many of these streets you will find dive-shops, convenience stores, more hotels, travel agencies and tour operators, Internet cafés, money changers, restaurants, discos and bars. The avenue radiates a vibrant and exciting atmosphere. Quinta Avenida bustles with even more energy as the sun goes down: at night, the bars along the avenue come to life creating a fun and exciting party atmosphere. If it’s shopping you’re into…Quinta Avenida is the place for you! 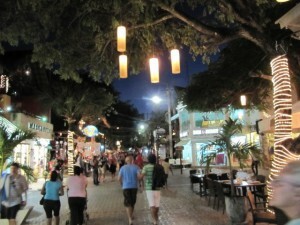 At the southern end of Playa del Carmen lies a private and upscale development area called Playacar. It was designed with the intent of establishing a sophisticated environment in a laid-back tropical setting. 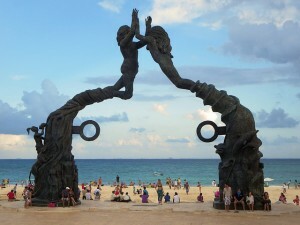 Playacar, is part of Playa del Carmen but it’s a gated community of assorted developments. This upscale, secure neighborhood has an 18-hole golf course designed by renowned architect Robert Van Hagge, an aviary; a number of interesting Mayan ruins, a dozen large all-inclusive hotels, and private condos, which are available for rent. Playacar has two sections: Phase I is oceanfront, Phase II is next to the golf course.The main gate for Playacar is located just north of Juarez off Hwy 307. 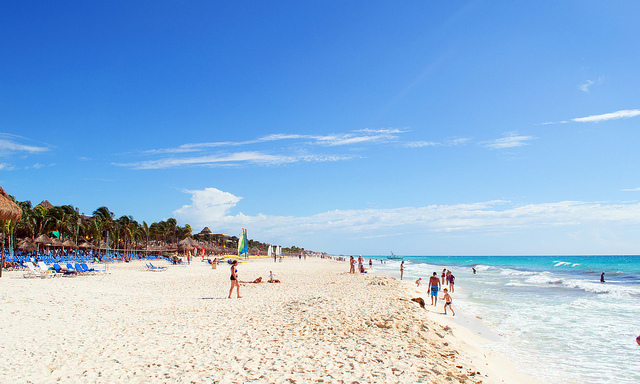 You can also walk into Playacar from Playa del Carmen either by walking along the beach or through the mall that is at the ferry docks. Just walk north and you will hit Playacar. If you are more of a nature buff, you might want to visit another of Playacar´s treasure: Xaman Ha Tropical Bird Aviary ! Around 60 or so species of birds, ranging form the common to the extraordinary, populate the place and live in harmony with one another, with a variety of other animals, and with the rest of their surroundings.